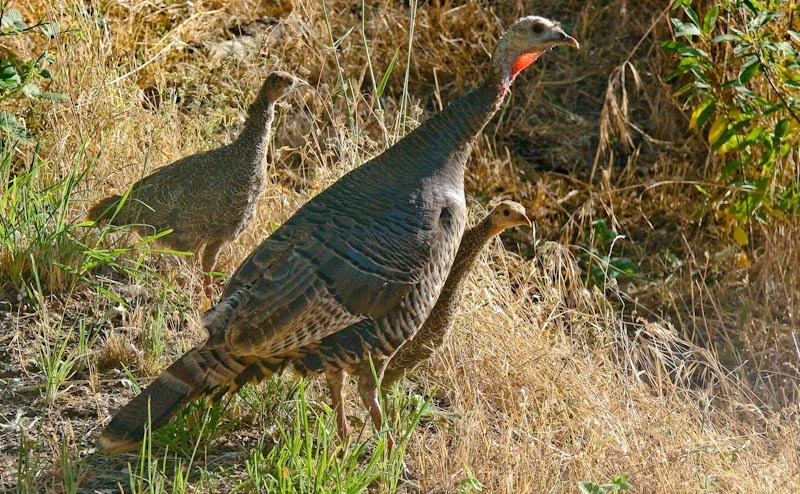 Fascinating capture of these wild elusive turkeys. Three of the them, excellent shot with amazing sharpness. Great job! We don't often get to see them in the wild, Jane...only on our dinner tables! They all do seem inquisitive. I love it. So sweet. You've made these little guys look cute..something not so easy to do. Love the detail in the feathers..the light as it shines thru the mama turkey's red neck. Great compo. Nice diagonals of pose and slope. And as Marcie says, the light shining through mama's neck is wonderful. very nice shot. it seems so expressive. awesome details on this photo. Awh, this is precious. They're all so apprehensive. Nice to know mom is there. This is a really nice image. I see wild turkeys a lot around where I live, but I haven't imagined a nice picture of them. This early morning light gives them a more appealing look. Great catch! great image - as you've caught them they are so full of personality. My uncle used to say, "All young life is beautiful," and this photo further substantiates that truth. These turkeys have such different coloration than the bronze-feathered ones in the Marin hills. Beautiful shot, she does look worried.